Be the first to share your favorite memory, photo or story of Annabelle. This memorial page is dedicated for family, friends and future generations to celebrate the life of their loved one. 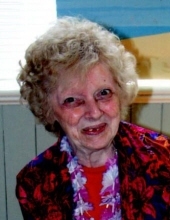 Annabelle Evelyn Tressler, age 82, formerly of near Libertytown, died Tuesday, October 16, 2018 at Northampton Manor Nursing and Rehabilitation Center, Frederick. Born January 9, 1936 in Frederick, she was the daughter of the late John and Bertie Clary Dennis. She was the wife of Samuel G. Tressler Jr. who died in 2000. Annabelle was an active member of the Liberty-Central United Methodist Church where she formerly served as a lay speaker. She was a farm wife on the family dairy farm, Tress-vale Farm, near Libertytown. In earlier years she was active with her children's schools as a reading assistant and PTA president. She enjoyed vegetable gardening and canning, getting her hair styled weekly and being involved in her children's school activities. Surviving are sons, Samuel G. Tressler III and wife Beth, John P. Tressler, Martin L. Tressler and wife Carla and Dennis P. Tressler and wife Cheryl, all of Mt. Airy and James M. Tressler and wife Pam of Union Bridge; sister, Virginia Garland of Amarillo, TX, brothers, John Dennis and wife Chuko of VA, Samuel Dennis and wife Martha of Fairfield, PA and Frank Dennis of TX; 14 grandchildren and 12 great grandchildren. She was predeceased by a son, Charles J. Tressler in 1986. A funeral service will be held at 11:00 a.m. Saturday, October 20 at Hartzler Funeral Home-Libertytown, 11802 Liberty Rd., Frederick, with Rev. Jerry Cline, her pastor, officiating. Interment will follow in Mt. Olivet Cemetery, Frederick. The family will receive friends at the funeral home 7-9 p.m. Friday, October 19. In lieu of flowers memorial contributions may be made to Liberty-Central United Methodist Church, P.O. Box 337, Libertytown, MD 21762. To send flowers or a remembrance gift to the family of Annabelle Evelyn Tressler, please visit our Tribute Store. "Email Address" would like to share the life celebration of Annabelle Evelyn Tressler. Click on the "link" to go to share a favorite memory or leave a condolence message for the family.